WEBCommentary(tm) - The Lone Kenyan Ranger and Tonto Cherokee-Warren: Composite Autobiographical Tales by Pre-President Obama and Elizabeth Warren. 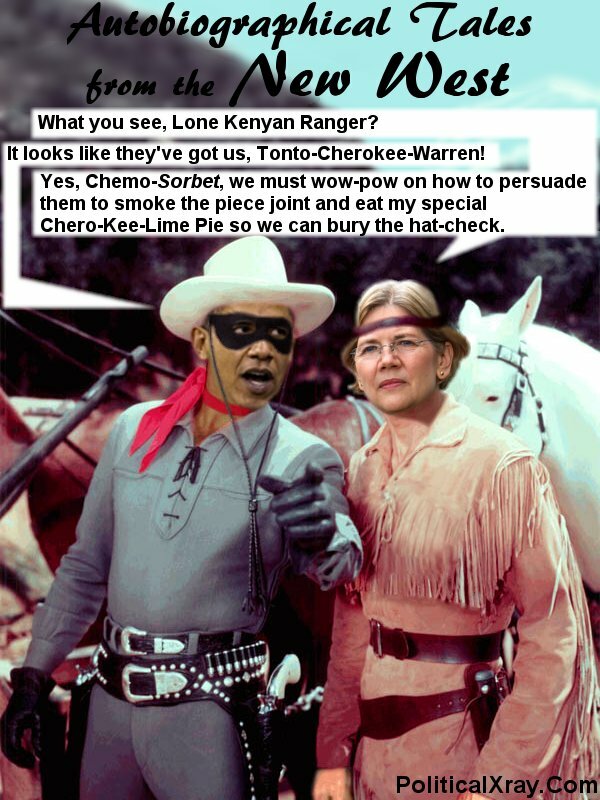 The Lone Kenyan Ranger and Tonto Cherokee-Warren: Composite Autobiographical Tales by Pre-President Obama and Elizabeth Warren. Mark Steyn has written authoritatively on the exotically creative approach to autobiographical and promotional material being pioneered by President Obama and Harvard Professor Elizabeth Warren. New artwork inspired by Steyn's article serves to illustrate the exotically creative techniques employed and/or authorized by both Obama and Warren. In the wake of the belated discovery that Obama's literary agency comprised the original "birther" instigator (in asserting that Obama was "born in Kenya" and "raised in Indonesia and Hawaii"), Steyn astutely noticed the exotically creative (or creatively exotic) techniques employed and/or authorized by Obama for dissemination of biographical information and ancestry to the media seem virtually identical to such techniques employed and/or authorized by Elizabeth Cherokee-Warren. According to the Right-Wing Zealot Mark Steyn, President Barack Obama and Native-American-Studies Harvard Professor Elizabeth Tonto-Cherokee-Warren collaborated on Autobiographical Tales from the New West. This may be the first in a continuing series of exposé episodes in the new genre of "Composite Political Autobiographies." Here, in Episode I, Tonto Cherokee-Warren says to the Lone Kenyan Ranger: "What you see, Lone Kenyan Ranger?" The Lone Kenyan Ranger, who points to the National Review article on a Native-American Indigenous News-Stand located on the Trail of Tears scouted by Tonto-Cherokee-Warren's ancestor ("Old Hickory Warren") replies, "Looks like they've got us, Tonto Cherokee-Warren," to which Tonto Cherokee Warren (upon noticing that such article analyzes Obama's literary agent's 11-year-long descrition of Obama as having been "born in Kenya") replies, "Yes, Chemo-Sorbet, we must wow-pow on how to persuade them to smoke the piece joint and eat my special Chero-Kee-Lime Pie so we can bury the hat-check."